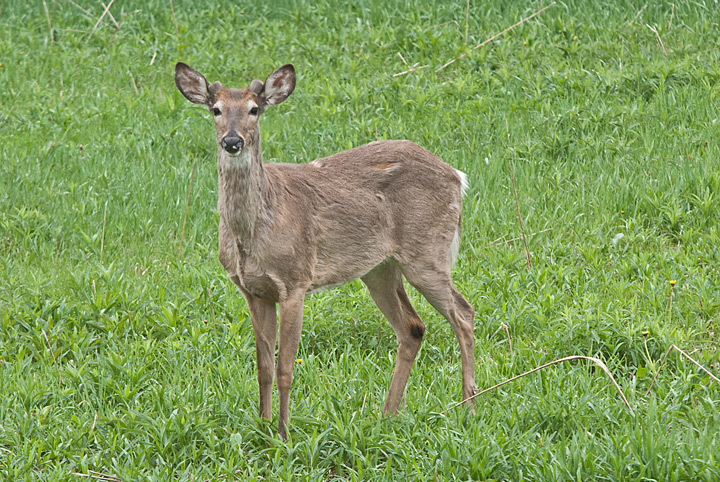 In addition to the Sandhill Cranes there was plenty of other wildlife to photograph as we drove around Crex Meadows. More photos from Crex Meadows can be found on my website. We saw the occasional White-tailed Deer. This one sopped along the road to pose. Red-tailed Hawks were flying over the Meadows. There were a lot of Hooded Mergansers around. I photographed this bunch just before they took off into the sunrise. With the low water levels in some of the ponds it was easy to find Great Blue Herons around. There were also quite a few American Coots around although no where near the hundreds I saw on an earlier visit. It’s the time of year when I review the birds that I’ve photographed around my farm during the spring. I was a fairly boring spring following a rather boring winter with not many new observations. None the less there were some interesting happenings. Probably the most interesting event was the return of the Easter Bluebirds. I was able to get my first shot of them on the first day of spring. What made this such a great year for bluebirds was the fact that I set up my turkey blind in the back yard and started photographing them when they started nest hunting and followed through while they built the nest and then defended it against Tree Swallows. 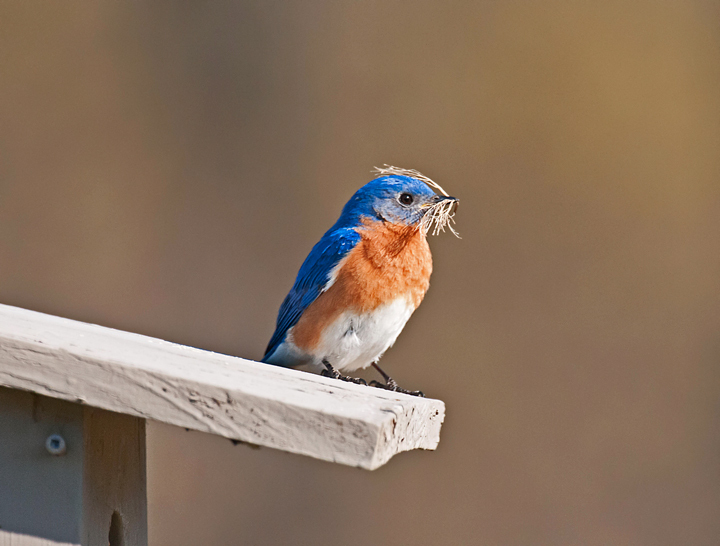 Apparently Easter Bluebirds build several nests at the same time and then end up using only one of them. That appears to be what happened this year. After building the nest they didn’t seem to be using it so I opened the nesting box up and sure enough there was a great nest but it wasn’t being used. This is the third year in a row that this has happened. 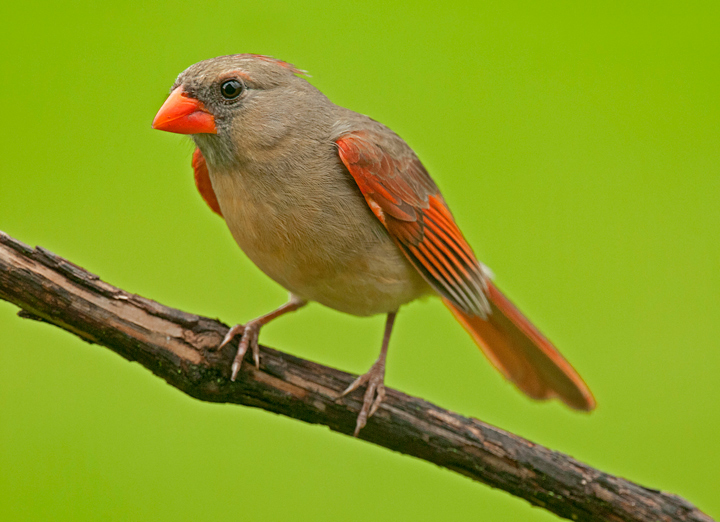 The second most interesting event was my problem with a female Northern Cardinal. As spring arrived the female cardinal started attacking my basement window. I kept hearing a sound in the basement but couldn’t figure out what it was. After several trips to the basement I noticed the female cardinal banging against the window. Our cat occasionally sleeps in the basement and it must have been driving him nuts. It turned out that the basement window was just the start of things. It then started attacking a large picture window. I tried to put something in the window to discourage it but it then moved to another picture window above it so I took the window blocker down. A couple of weeks later I was awakened by a sound outside my bedroom window. When I looked she was banging against my bedroom window just after sunrise. After about a week of this I pulled the blinds and that put a stop to it. Attacking the windows went on for about six weeks. At one point I thought it had stopped and started to clean the windows but it started again after a few days. 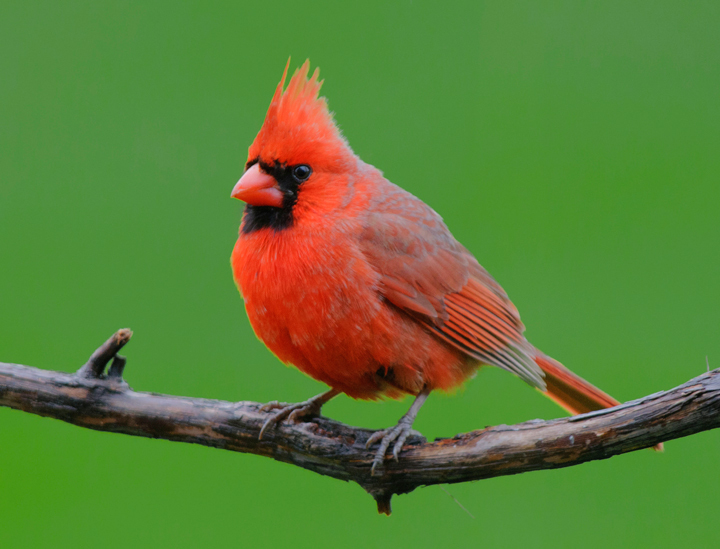 The male cardinal would just sit on a tree branch, with a confused look and watch her. When she finally did quit it was a big chore to clean the windows. Typical window cleaning didn’t work and I ended up using a scratch free scouring pad to get the gunk off. 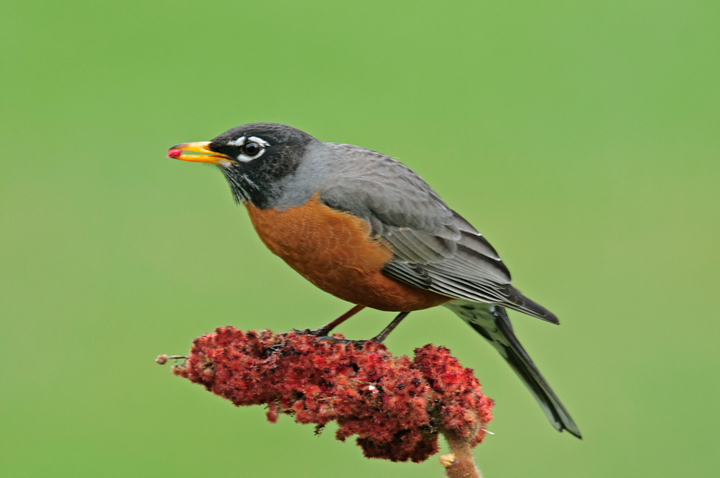 Early in the spring when the American Robins return they sometimes don’t have worms to eat so they love eating Sumac Berries. I usually put them out for the Eastern Bluebird but the Robins also feed on them. 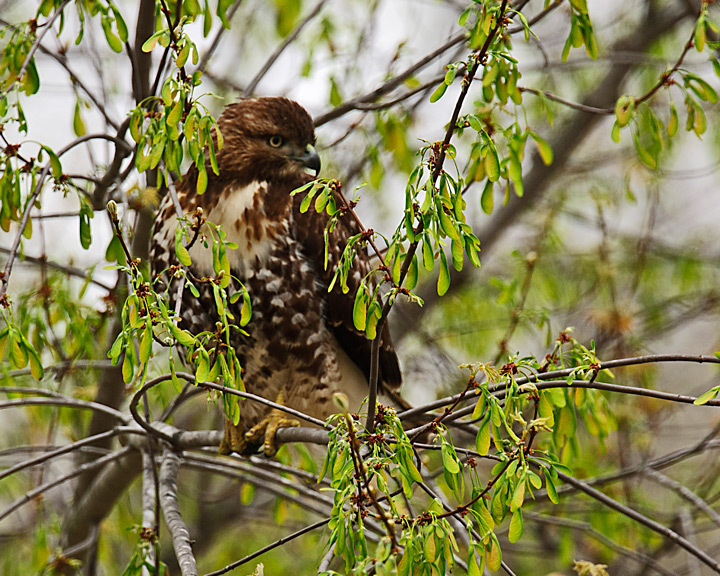 For a few weeks I had a Red Tailed Hawk that was perching in a tree in the back yard. He had a great view of my backyard prairie. I would see him perched on the same tree almost every day. I could usually tell when he was there because the Crows would soon be gathering to drive him away. 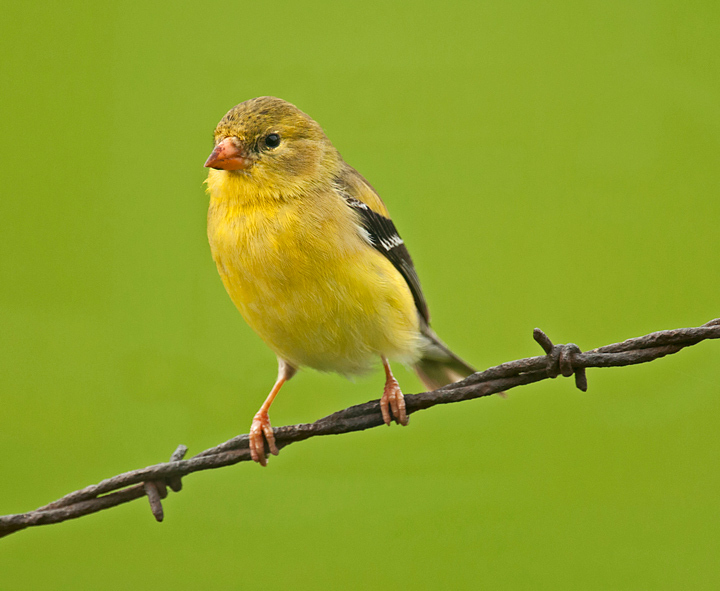 American Goldfinches are my most frequent visitor in terms of numbers. They congregate in large numbers throughout the year. They eat me out of house and home. They particularly love Black Sunflower seeds. 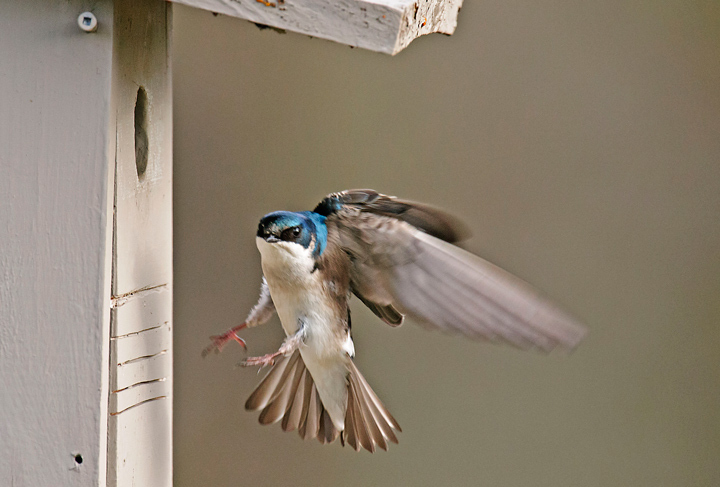 As I noted above I have Tree Swallows nesting around the farm. 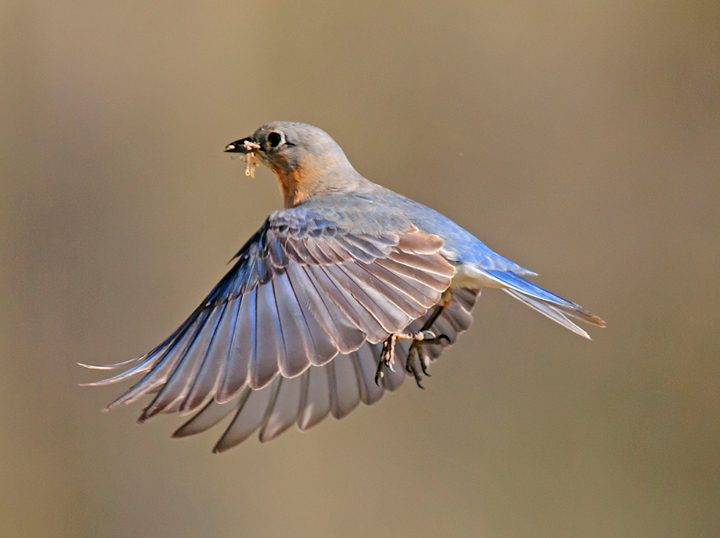 They usually battle the Eastern Bluebirds for nesting rights. This year the bluebirds won although as I indicated they ended up not using the nesting box. The Tree Swallows wanted the one about ten feet from the bluebirds but ended up taking another nest. The irony of it was that at the end of spring the Tree Swallows ended up setting up their second nest in this house. 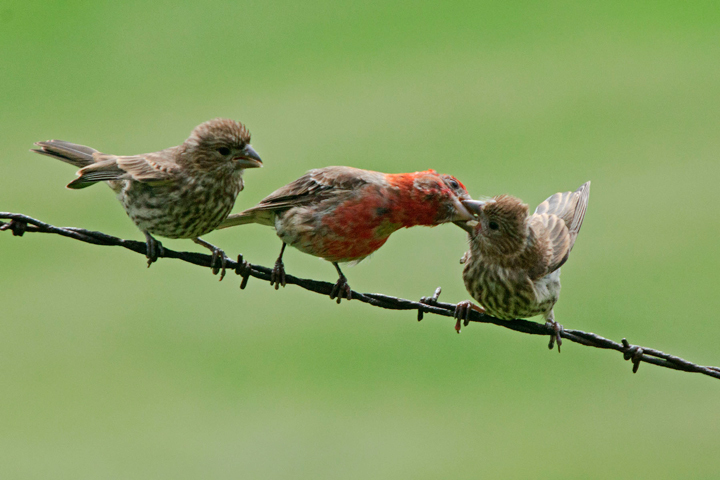 Generally I have a few House Finches around my feeders. I mainly see them when they bring their fledglings to the feeder late in the spring. I can usually get a few shots of the adult feeding the young. For quite a few years I’ve had Eastern Phoebes nesting above a light over the back door of the garage. Last year they abandon the nest. This year they started nesting in the corner of my house under the deck. The first batch fledged just after the first of June. We weren’t around and didn’t seem them fledge although I did see the whole family out in the woods about a week later. This shot is a little is a little unusual. 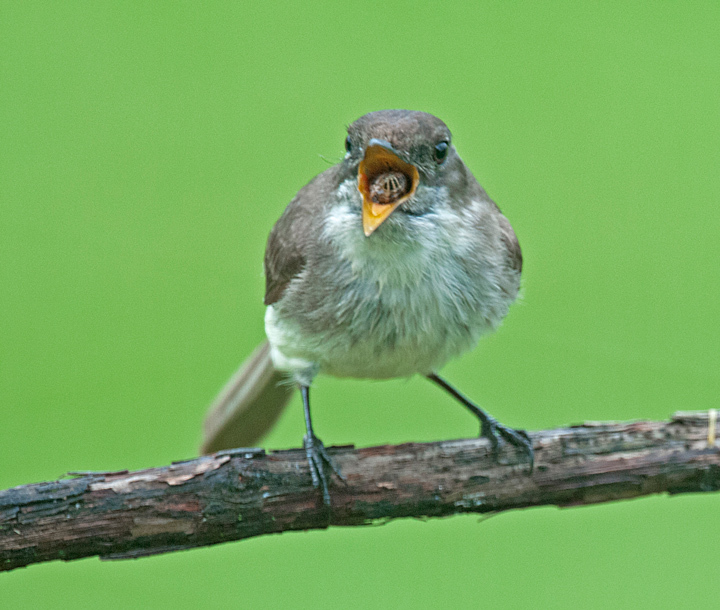 I was photographing a phoebe while it was attempting to eat a worm. After thrashing around with it for a while it suddenly went down the hatch. I just happened to catch it. I usually have Song Sparrows nesting in some bushes in front of the house. They are near my feeders so I occasionally get a shot of them. This year, for the first time, I managed to get a shot of an adult feeding one of the fledglings. 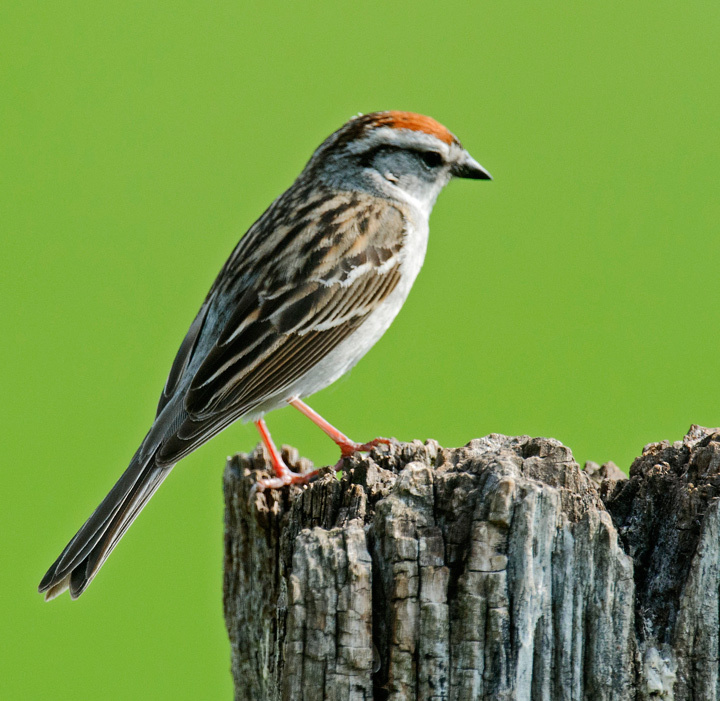 Early in the spring I had a number of Chipping Sparrows around. I thought they were also going to nest around the house but they seem to disappear later in the spring. 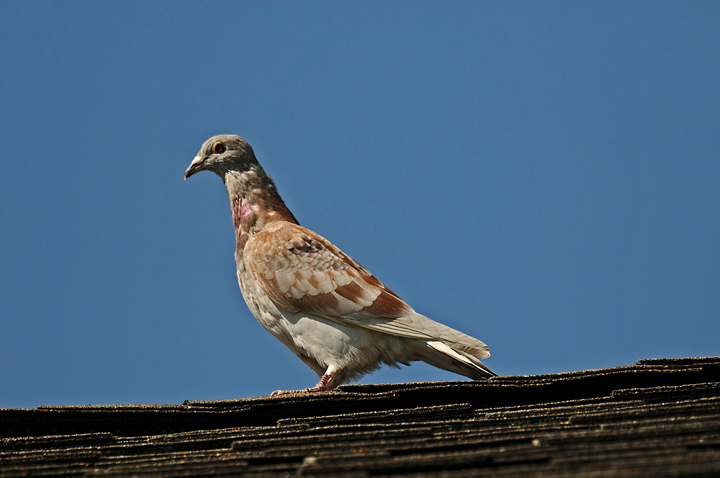 This year, for the first time that I can remember, I had a Pigeon appear on the farm. The neighbor has all kinds of them on his barn but they never show up at my house. I noticed him while I was mowing the lawn and after watching him for about fifteen minutes I decided to go in the house and get the camera since it was such an unusual sight. 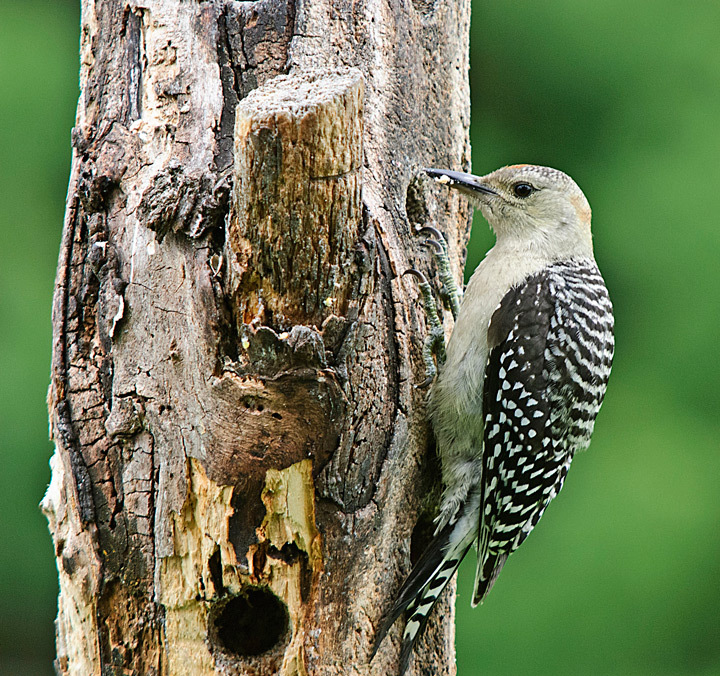 I normally have Red-bellied Woodpeckers around the feeders all year around. They love suet but only the commercial stuff not the suet you purchase from the meat market. 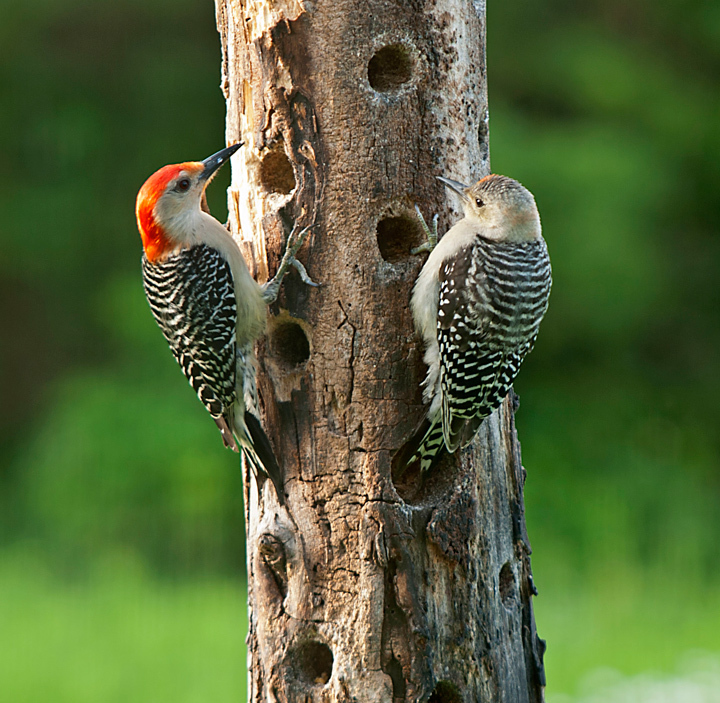 I have an old log that I drilled holes in and fill with suet that I use for a feeder. It makes a good prop for photography. This year for the first time a fledgling showed up with an adult. I tried to get a photo of the adult feeding the fledgling but it was too dark. After a while the fledgling started showing up on its own. I suspect the adults were busy with another batch of young. 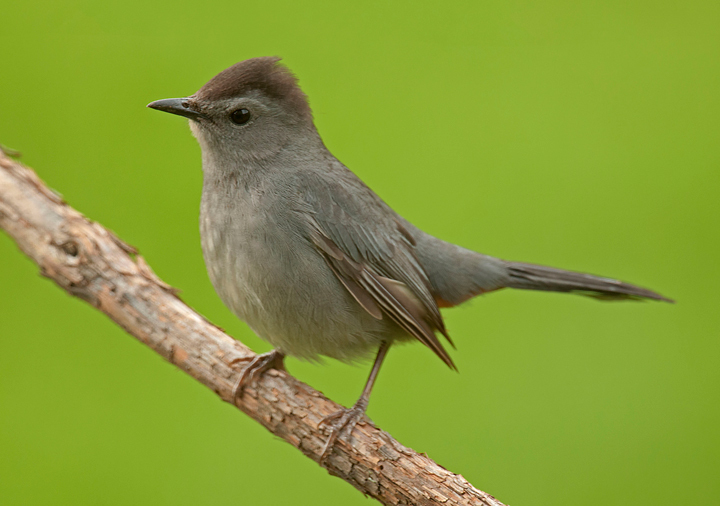 I normally have a pair of Gray Catbirds nesting in front of the house. They are a beautiful bird. I could see that they had a nest but couldn’t find it but would see them bringing food to the young. What a difference a year makes. Last year I had large numbers of Baltimore Orioles arrive in the spring. 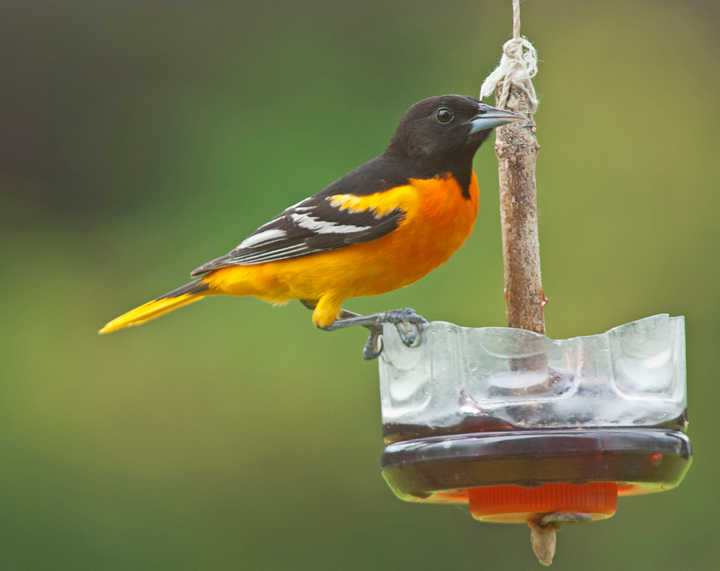 There were so many orioles around the area that the stores ran out of grape jelly. 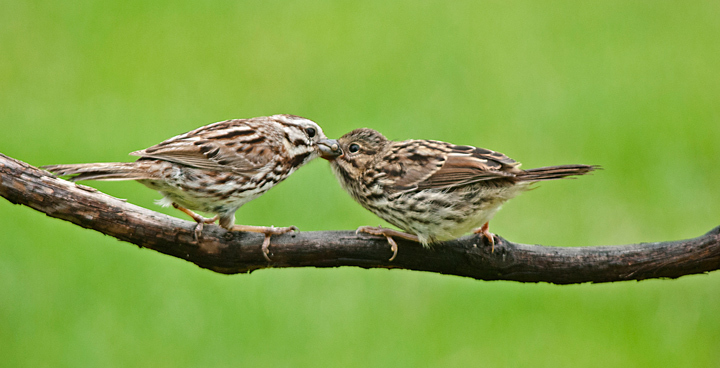 I would frequently have six or eight birds around the feeders at any one time. This year I saw a couple of them at the feeders and they were gone off to nest. I think this is my only photo of one. More birds of spring photos can be found on my website. 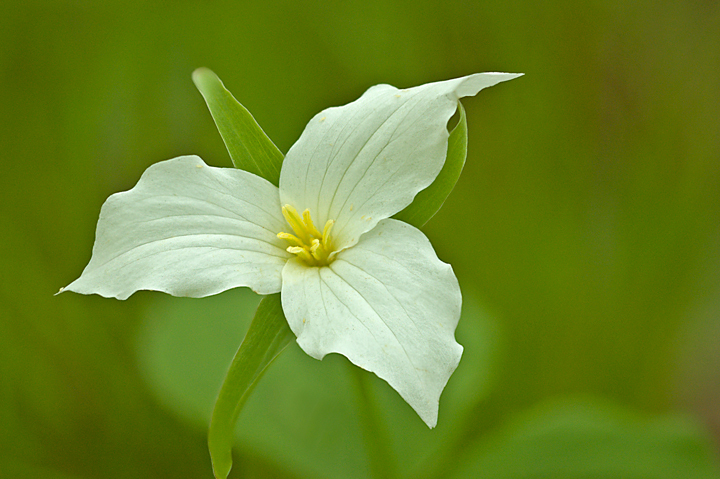 It has been rainy and storming out quite a bit the last couple of weeks so I have not had many opportunities to get out into the woods and check on the wild flowers. A couple of days ago I did manage to get out between rain storms. 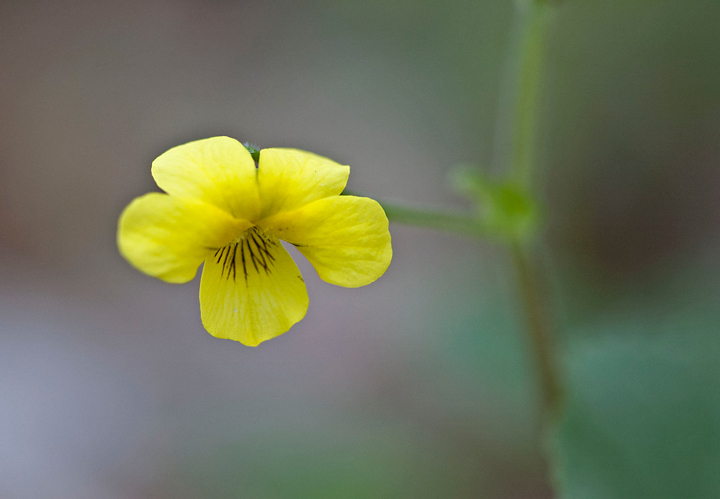 The main flowers in bloom right now are the Large-Flowered Trillium, Common Blue and Downy Yellow Violets. I’m also starting to see the Wild Geraniums and Wild-flowered Bellworts. The Cut-leaved Toothwort is just starting to bloom. More spring birds are starting to return. 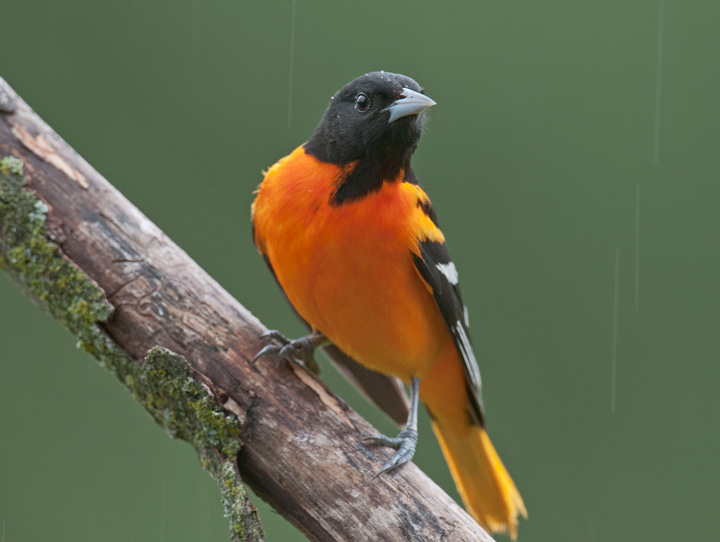 On the third of May we saw our first Baltimore Oriole. I quickly went out and put up a sugar water feeder and some Grape Jelly. 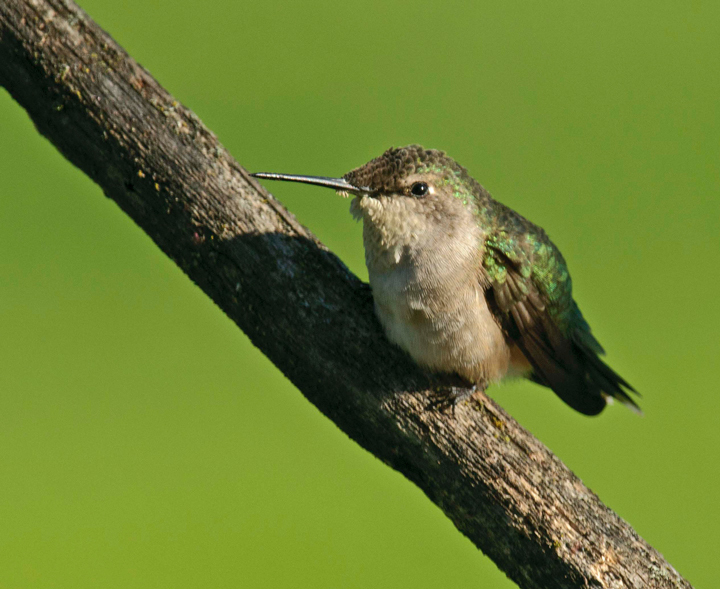 Later in the morning we also noticed a couple of Ruby-throated Hummingbirds at the feeder. Later in the week there was a pair of Red-breasted Grosbeaks at the feeder. 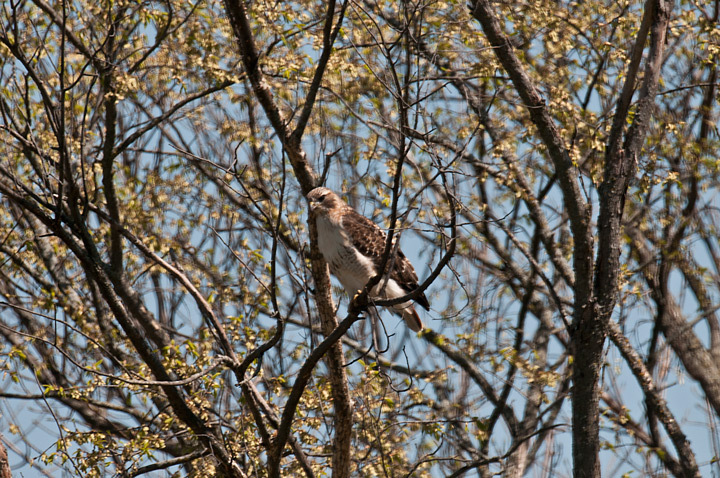 In addition to the spring birds I have also been seeing a Red-tailed Hawk hunting in the back yard. He usually comes to a large dead tree at the edge of the field and takes up his hunting position. A couple of times I’ve seen him dive into the grass but it didn’t look like he caught what he was after. He also brings his friends along with him. Shortly after he arrives on his perch the crows start to show up. He usually attracts about a half dozen of them. While he hunts they are usually busy attacking him. Late in the week I noticed four White-tailed Deer in the front yard. They were all bucks that were just starting to grow their horns. More spring photos from the farm can be found on my website.